IHG Rewards just released their “Into The Nights” promotion where you can earn up to 2 free hotel nights by completing a set of tasks. The promotion requires you to complete a set of tasks where you earn bonus points for completing a certain amount of tasks. Many will ask, are 50,000 points worth two free nights? In short, the answer is no, there are some high end hotels, namely InterContinental that require 30,000 points (Intercontinental Fiji Golf Resort & Spa), so the offer of 2 free nights is a bit of a white lie. That said, there are plenty of great hotels for the 25,000 point level, so the offer is still pretty lucrative. I value IHG Rewards points at 0.65 cents per point, so my offer could net $345, not a bad haul for two stays! This promotion runs from September 4, 2014 – December 31, 2014. 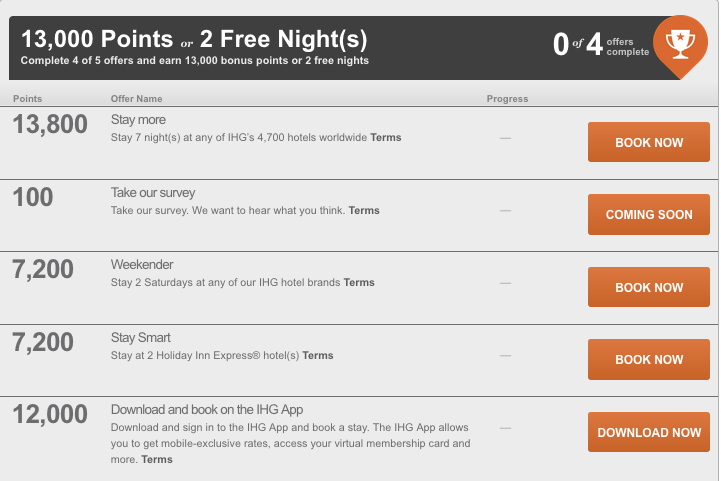 How Do I Register for IHG Into The Nights Promo? Just follow this link and enter your IHG Rewards number along with your pin and you will be registered. Each person will get a unique offer that is based on your prior hotel stay activity with IHG. In my case I was offered 5 different tasks and in order to earn the full 53,300 points, which equates to 2 free nights, I need to complete 4 of the 5 tasks. I was offered the following tasks to earn my two free nights. As you can see, the easiest task is to simply book a stay on their mobile app, which would earn 12,000 points right off the bat. If I make that night one of my two Holiday Inn Express nights on a Saturday night, and then do another Saturday night, I would earn my full 53,300 bonus. Not a bad haul for only two nights. It might even make sense to do two mattress runs, if I can do them for under $100 each. The following types of stays do not count toward earning the two free IHG nights. Depending on the offer you receive, this could be a highly lucrative promotion that might even be so easy that it would warrant a mattress run (or two) in order to earn the full bonus. 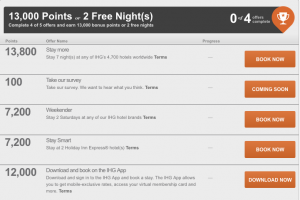 One Response to "IHG Rewards Two Free Nights “Into The Nights” Promotion"